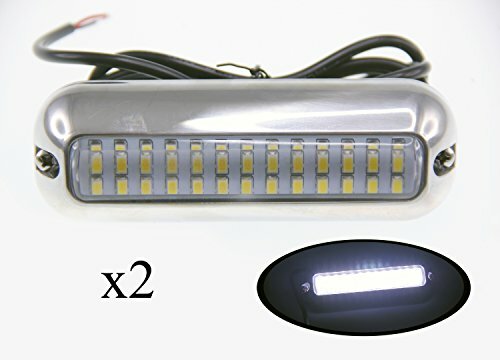 This a set of 2pcs of energy efficient and attractive cool white led underwater light with stainless steel housing. It is easily installed on the surface and does not require a through hull installation. Material: Stainless steel 316. Housing color: Polished stainless steel. Led quantity: 39. Led color: Cool white. Working voltage: 10-30 vdc. Wattage: 5.2w. Beam angle: 120. Led life time: 50000 hrs. Effective lumen 416lm. Ip rating 68. Instruction is included. Item# p00302whx2. Dimension: 4 3/4" x 1 5/8" x 3/4".